These are Styrofoam eggs I got at a store with other colors in the bag to use for a table decoration for Easter. I'm going to display them in a little plastic pink basket. Great still life...I'm sure they will make for great Easter decorations. Lovely colour, they look quite sparkly. I am sure they will make excellent Easter decorations. Robin's egg blue- a lovely addition to the Rainbow month. Nice little sparkle on the eggs and fun with your rainbow! Great capture. Nice colors and great pov. Fav. I love the reflection of them on the table! Great pov and love the colour! Perfect for Rainbow month with a nice reflection too. Lovely colour and sparkle. 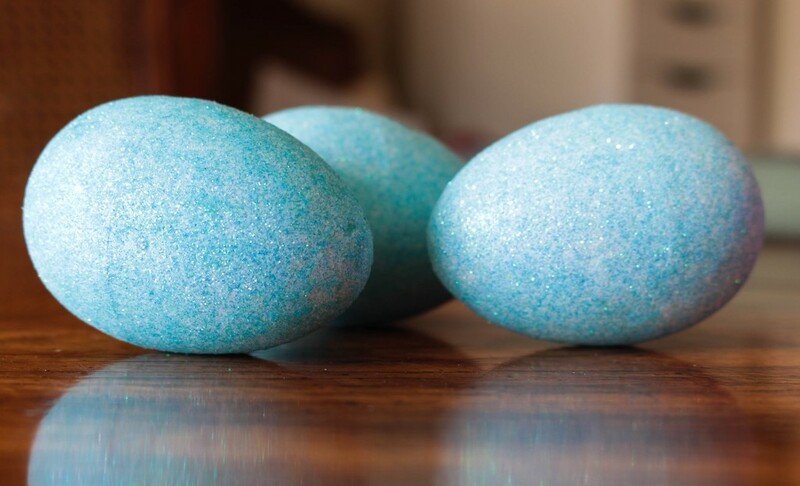 They will make magnificent decorations for Easter. And I thought they were real. Nicely shot.